Oil prices fell on Wednesday after industry data showed a build in U.S. crude stocks and OPEC reported a rise in its production despite a pledge to cut output. Brent crude oil was down 44 cents a barrel at $48.28 by 10:33 GMT. 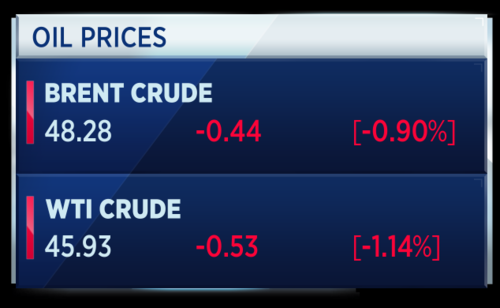 U.S. crude was 53 cents lower at $45.93. Crude prices have fallen more than 10 percent since late May, pulled down by heavy global oversupply that has persisted despite a move led by the Organization of the Petroleum Exporting Countries to curb production. OPEC and other exporters such as Russia have agreed to keep production almost 1.8 million barrels per day (bpd) below the levels pumped at the end of last year and not to increase output until the end of the first quarter of 2018. Good morning and welcome to World Markets Live for Wednesday 14th of June. We'll begin full coverage from 0600 GMT. 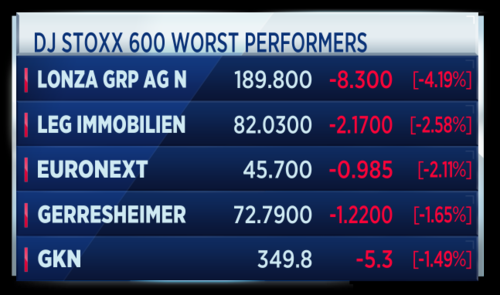 For now, here are the opening calls for European markets. These are the top headlines this morning. It's the $4.5 trillion question - Investors look for answers on what the Fed will say about shrinking its mammoth balance sheet, as Janet Yellen and co are expected to hike rates. "Our door remains open." 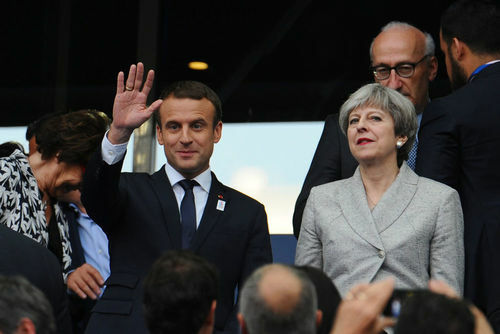 French President Macron says Britain is welcome to stay in the European Union, but warns Brexit talks should drag on, as he hosts UK Prime Minister Theresa May at the Elysee. "An appalling and detestable lie." U.S. Attorney General Jeff Sessions denies allegations he colluded with Russia in a heated exchange with lawmakers on Capitol Hill. Uber CEO Travis Kalanick takes a temporary leave of absence, as a damning report by former U.S. Attorney General Eric Holder criticises the ride-hailing company's "dysfunctional" corporate culture. 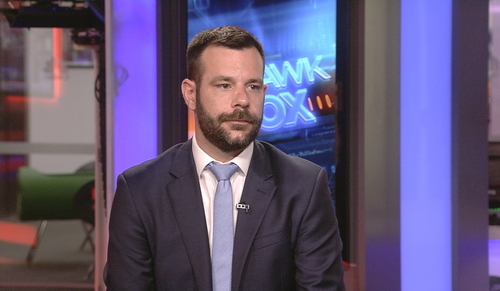 Morgan Harting, portfolio manager of emerging market multi asset portfolio at AllianceBernstein, says a Fed rate rise is well priced in and that he doesn't think it will not raise rates today. What we see is when growth is strong the Fed tends to be raising rates. The last time the Fed really raised rates was in 2004, when it went from 1 percent to 5.25 percent and over that time we saw emerging market assets rally by 135 percent. A 24-storey building in West London which was engulfed by a huge fire overnight. Around 200 firefighters continue to fight the blaze which raged through Grenfell Tower on the Lancaster West Estate. The Met Police says residents are being treated for a range of injuries. 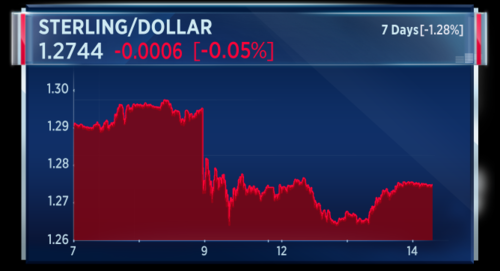 Sterling appears to have stabilised in the wake of last week's general election result amid signs that the UK Prime Minister could be forced to soften her stance on Brexit. 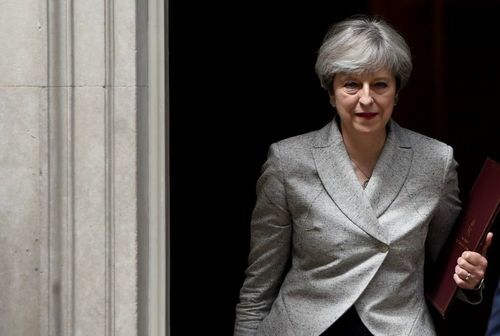 A host of senior figures within the Conservative Party, including former Prime Minister David Cameron, are urging Theresa May to take a more collegial approach to Brexit talks. Meanwhile, speaking during a joint press conference with the British Prime Minister, French President Emmanuel Macron raised the prospect of the U.K. abandoning Brexit altogether. Generali's CEO says he is unwilling to contribute to Veneto Bank's rescue. That's according to Reuters citing a newspaper report. The CEO says interest rates will dictate decisions over the insurer's stock of Italian government bonds and that he wants to invest also in other asset classes. U.S. Attorney General Jeff Sessions denied that he colluded with Russian interference in the presidential election -- calling the allegation a "detestable lie." 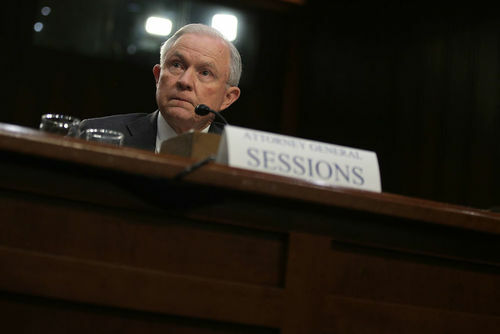 Testifying before the Senate Intelligence Committee -- Sessions repeatedly refused to answer questions from Senate Democrats -- saying it would be improper for him to discuss private conversations he had with President Trump. Sessions also defended his recusal from the Russia investigation as a procedural matter rather than an indication of wrongdoing. Change at the top of China's Anbang insurance, an aggressive buyer of overseas assets. 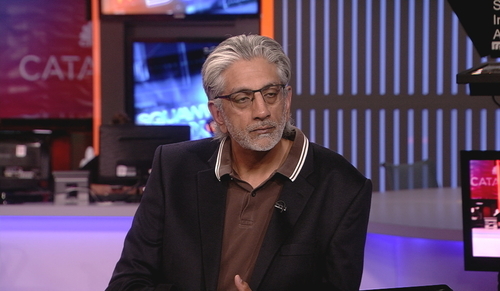 The firm says its Chairman is no longer able to fulfil his duties, citing personal reasons. Other executives are taking over his responsibilities. 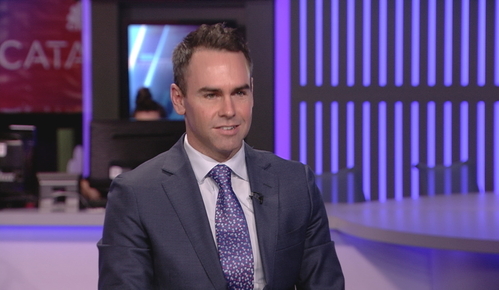 Morgan Harting, portfolio manager of emerging market multi asset portfolio at AllianceBernstein, says the broader picture in China is brighter for investors. What we’re seeing is earnings growth of 30 percent. Capacity utilization is rising because excess capacity at state owned companies has been shut down and on-going demand has absorbed private sector capacity. This has improved pricing power for Chinese companies. Harting says he sees value in Chinese consumer and infrastructure companies, as well as banks. In U.S. markets, the Dow closed at a record high and the tech sector shook off a two-day losing streak. 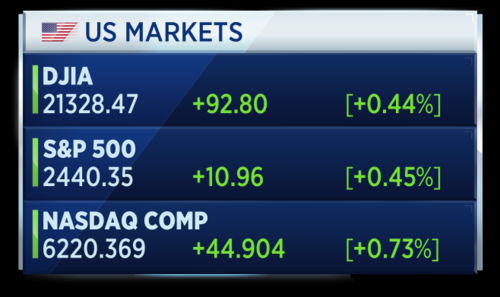 Meanwhile, the S&P 500 gained about half a percent on its way to a record close, with information technology and materials stocks leading gains. 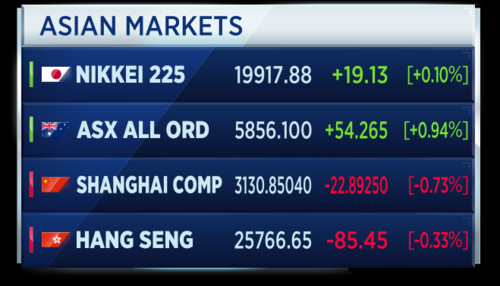 In contrast, Asian stocks lagged behind. Economic data from China show a miss for urban investment in May, hitting stock markets. Japan's Nikkei rose cautiously. New turmoil at Uber. 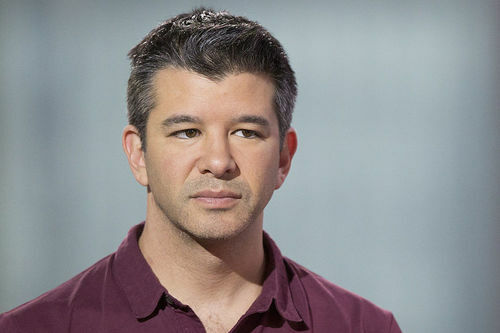 CEO Travis Kalanick (pictured) has taken a leave of absence and a board member is out. The ride-hailing company is implementing recommendations from an investigation into its company culture by former U.S. attorney general Eric Holder. Board member David Bonderman stepped down after uproar about a remark he made at a staff meeting. The private equity executive and Uber investor apologised for saying that more women on a company board leads to "more talking" in meetings. Nearly 200 Democratic senators and representatives are suing President Trump. They argue the President has violated the Constitution by accepting gifts from foreign leaders without Congressional approval. This comes a day after the attorneys general of Maryland and the District of Columbia also brought a lawsuit against Trump alleging payments to Trump were illegal. 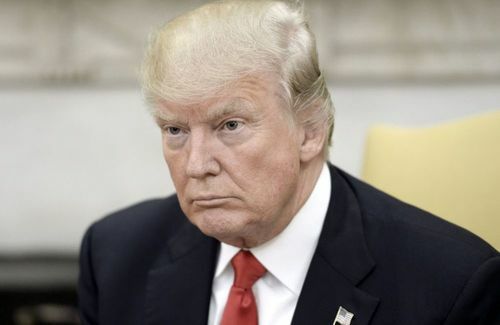 President Donald Trump reportedly told Republican senators that the health care bill passed by the House earlier this spring is "mean." According to an Associated Press report, Trump urged the senators to craft a "more generous" version. Trump originally celebrated the bill's passing in the House with a Rose Garden speech surrounded by the Republicans who supported it. 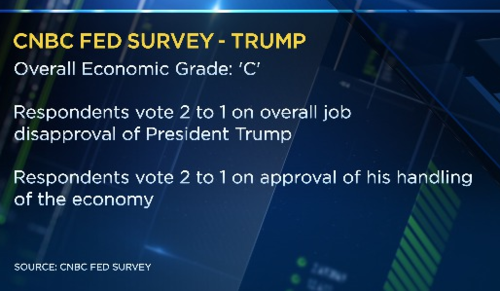 Respondents to CNBC's Fed survey have graded President Trump's first 100 days with a 'C' on the economy. It was two to one in disapproving of the overall job President Trump is doing but by the same ratio they approved his handling of the economy. His business deregulation and tax cut plans were voted to be very positive while healthcare and trade policies were seen as very negative. Mark Weinberger, global chairman and CEO of EY and a member of President Trump's economic advisory council, says he is not a fan of 100 day scorecards. Obviously there are a lot of distractions that people would rather see go away in terms of derailing the economic agenda. That being said, we just had a business roundtable meeting, which is the 200 plus biggest businesses in the United States, and WPP is there and BP and other European companies, and the Secretary of Labor was there and we talked about deregulation, we talked about tax reform. What’s really going to make or break the U.S. economy is whether or not these things get done in the coming couple of months or so. 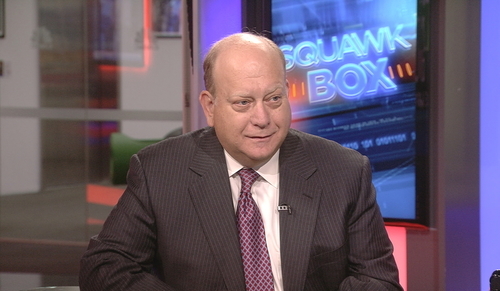 Steve Liesman has broken down the latest results from CNBC's survey on what Wall Street is expecting from the Federal Reserve. These are the top headlines this hour. "Our door remains open." French President Macron says Britain is welcome to stay in the European Union, but warns Brexit talks shouldn't drag on, as he hosts UK Prime Minister Theresa May at the Elysee. Chinese insurance giant Anbang says its chairman is "unable to perform his duties" amid reports he has been detained by authorities. Firefighters continue to fight a blaze that has engulfed a multi-storey tower block in West London. The Federal Reserve is widely expected to raise interest rates by a quarter point when it concludes its policy meeting today. A hike would be the second this year, and the fourth of the cycle it began in December 2015. Economists' forecasts for a third rate hike this year have faded, amid worries of weakening inflation. 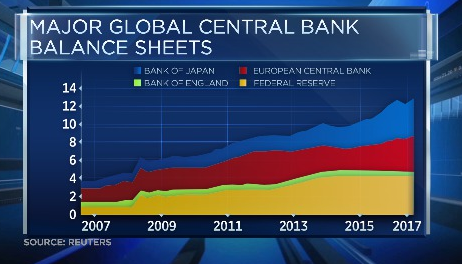 The central bank's massive balance sheet is also a major concern. Bob Janjuah, senior independent client adviser at Nomura, says the Federal Reserve wants to normalize and so will look through the low inflation outlook. The thing the fed will focus on is unit labor cost, that’s a bigger issue for them there. I think they will try and normalize gradually. Clearly the balance sheet is the big issue for markets, how the Fed addresses the balance sheet issue. A 25 basis point hike now probably doesn’t shake the markets too much. Janjuah adds that last year the Fed was looking for reasons to hike. Now, it needs very strong reasons NOT to hike. British American Tobacco has posted an earnings update. The company says its business continues to perform well and market share growth continues. First half earnings per share is expected to benefit from a currency translation tailwind of around 14 percent. However, it also sees an adverse transactional impact on operating profit of 2 percent for the first half and full year due to current forex rates. Speaking during a joint press conference with the British Prime Minister, French President Emmanuel Macron raised the prospect of the U.K. abandoning Brexit altogether. Charles Lichfield from Eurasia Group shares his thoughts on where Brexit is headed. It seems there has been some effort to co-ordinate the European response to the U.K. general election last Thursday. I remind viewers that the prime minister didn’t win a majority and so a lot of scenarios are now open as far as Brexit is concerned, although Theresa May remains in power and for the moment the U.K. government’s policy is to negotiate Brexit. It simply seems to be the case that Europeans are opening the door to more political upheaval in the U.K. which I think is likely and therefore they are simply stating their policy which is at it has always been, which is that while the talks go on there is an opportunity to stop this, but it doesn’t seem likely for the moment. NBC's Kasie Hunt reports from Capitol Hill, where U.S. Attorney General Jeff Sessions denied that he colluded with Russian interference in the presidential election. A fire raged through the night at a tower block in central London, with 30 people being taken to five different hospitals for their injuries. More than 200 firefighters and as many as 40 fire engines were sent to the location to tackle the blaze. 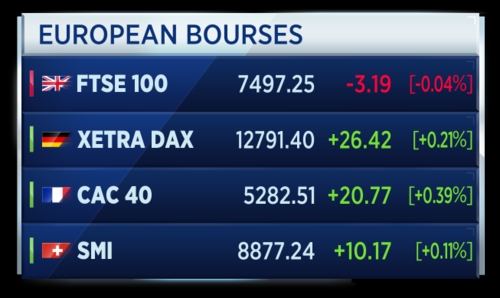 These are the opening calls for the major European bourses ahead of the market open. Inflation data has been released for several Eurozone countries. Finland's consumer price index rose 0.7 percent year on year in May, according to Statistics Finland. Germany's final May reading of EU-harmonized CPI fell 0.2 percent on the month. On the year, inflation grew 1.4 percent. Swedish inflation is forecast at 1.7 percent in 12 months and 2.1 percent in 5 years, according to a poll commissioned by the Riksbank. These forecasts are higher than the results of the previous survey from March. 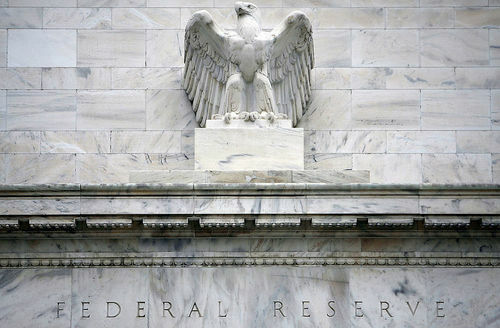 Kenneth Taubes, head of U.S. investments at Pioneer Investments, says an interest rate hike by the Fed is priced in today, but does not anticipate a more hawkish stance than the one expected. Given the fact that the data has weakened on the margins from part of last year and inflation has come off the boil, so to speak, that there’s really no reason to expect a more hawkish Fed, in my opinion. However, that also means that if they were for some reason more hawkish the market is not prepared for it. But I think that is very unlikely given the set of circumstances I just described. Taubes says the roll back and containing of government regulation expense expected from the Trump administration is increasing optimism in the U.S. 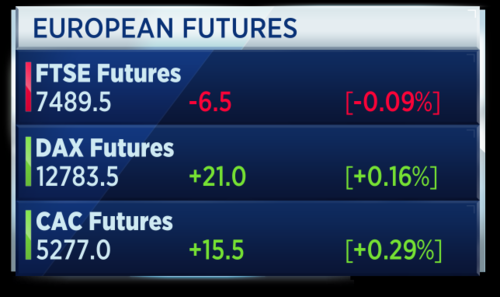 Here's a round-up of important live blog, CNBC, business news, real time events ahead of the European market open. Inditex posted a double-digit rise in earnings for the first quarter. The Spanish owner of Zara met analysts' forecast with an 18 percent rise in net profit. It beat consensus with a 17 percent jump in EBITDA. Sales were also strong with a 12 percent year-on-year rise. Elliott is calling for an upgrade of BHP Billiton's board of directors. This as the mining giant prepares to name a new chairman. The activist shareholder blamed the "entrenched board" for approving a series of disastrous acquisitions and badly-timed buy-backs. Elliott says the moves are to blame for the company's underperformance. The public listing of Allied Irish Banks is now fully subscribed, its bookrunner says. The bank is selling a 25 percent stake on the Dublin and London stock markets later this month, in one of the biggest bank listings since the 2008 crisis. Generali CEO Philippe Donnet says the Italian insurer will not contribute to the rescue of ailing lenders Popolare di Vicenza and Veneto Banca. Speaking to an Italian paper, he said Generali has already done its part by paying into the Atlante 1 fund. Italy's economy minister said earlier that the government was "close" to finding a solution for the troubled banks. 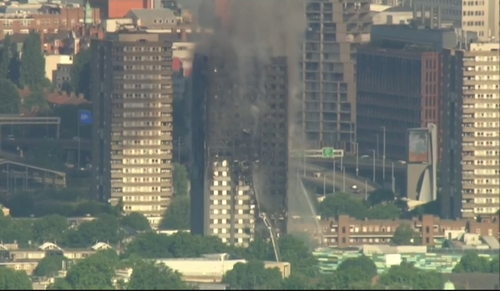 The London Fire Brigade has confirmed fatalities from a fire that has engulfed a tower block in west London. The service said 30 people have been taken to 5 different hospitals in the area. London Fire Brigade said over 200 firefighters were on the scene to tackle the major blaze at a tower block in north Kensington. A cautious but positive start to trading in Europe. This following fresh records on the Dow, S&P and Russell 2000 indices last night. The FTSE just slightly lower as it wrestles wit a grip on the 7,5000 mark. Activist investor Elliott Management has called on BHP Biliton to "upgrade" its board of directors, accusing the present board of "having approved the disastrous acquisitions and poorly timed share buybacks" leading to the miner's underperformance. Elliott has acquired a 4.1 percent stake in BHP Biliton, and has called on the firm to exit from its US oil shale business. British American Tobacco continues to ride the weaker pound, saying the favorable exchange rate would lift its operating profit for both the first half and full year. BATS also continues to grow maket share while trading in line with expectations. But the Lucky Strike cigarettes producer expects profit growth to be weighted to the second part of the year due to the phasing of shipments combined with product and marketing investment. First quarter net profit at Spanish retailer Inditex rose 18 percent, in line with analyst estimates. The Zara owner reported first quarter sales of 5.57 billion euros, up from 4.88 billion euros a year ago. Swedish measurement technology firm Hexagon could be considering a possible sale to rivals, valuing the firm at around $20 billion. This, according to a report from the Wall Street Journal. Noting recent media speculation about a possible deal, the company said the market would be informed "should the evaluations lead to concrete results." 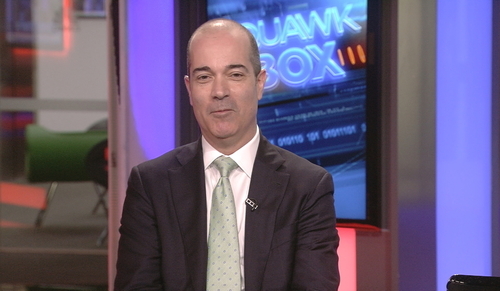 Julien Lafargue, vice president of European equity strategies at JP Morgan Private Bank, says he still likes equities. Our preference at this point lies within Europe and in Eurozone in particular. That’s where we believe we have the most upside going into year end. That’s where finally we have some clarity, that hasn’t been the case for many years. There’s also support from earnings growth. The only thing that was causing us concern early on this year was politics and it looks like we’re going past that, so the next 6 to 12 months looks pretty solid for the region. 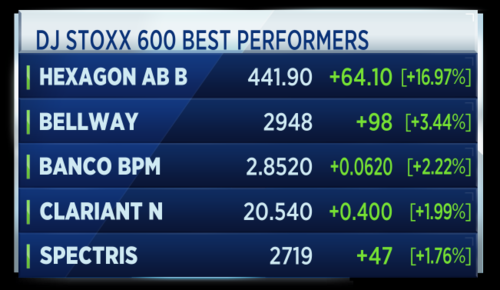 Unsurprisingly, Hexagon is at the top of the Stoxx 600 when ranked by session percentage moves. Bob Janjuah, senior independent client adviser at Nomura, says he prefers Japanese equities to European equities in the next two or three months due to concerns around Italy. We’ve got through Macron but we’re going to have an election in Italy by May. I know that this may not be the consensus view, but I think people have now realized that 5 Star and Northern League are talking. They would never have an alliance, but they may join together to force a referendum. I think the Italian people would vote to remain, but the mere fact of a referendum or a possible referendum, I think the volatility in markets would be enormous. However, Janjuah says such an event would push the ECb to step up and deal with systemic risks. The Times newspaper is reporting that U.K. Chancellor Philip Hammond is lobbying the prime minister to ensure Britain remains in the Customs Union after Brexit. 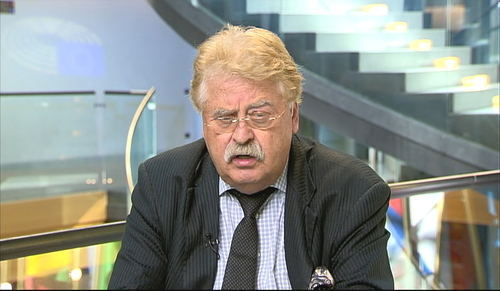 Elmar Brok, the European Parliament's Brexit Sherpa, discusses whether or not there is a chance that the deadline for Article 50 talks can be extended if Theresa May is unable to start talks on June 19. First of all, it would be wrong to prolong it now. Secondly, it would be very difficult. It means that all 27 member countries have to agree to that and that is only for a short time possible: the two-year limit is written in primary law, it’s written in the Lisbon treaty of the European Union and therefore it would be very difficult to overcome that deadline. Brok says the EU is waiting for the U.K. to come to talks and criticizes the country for having no strategy for negotiations one year after the EU referendum. 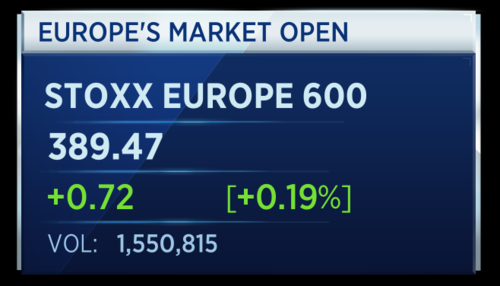 European stocks trade cautiously higher as investors wait to see what the Fed will have to say about how it's going to slim down it's $4.5 trillion dollar balance sheet. Earnings at Inditex rise 17 percent in the first quarter as margins and sales at its flagship store Zara get a boost from an increased international presence. 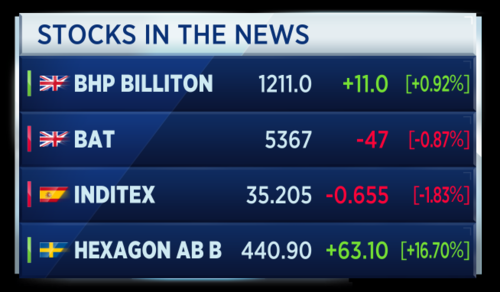 Hexagon shares hit a record high in Stockholm after reports the IT company may be sold to rivals for $20 billion. 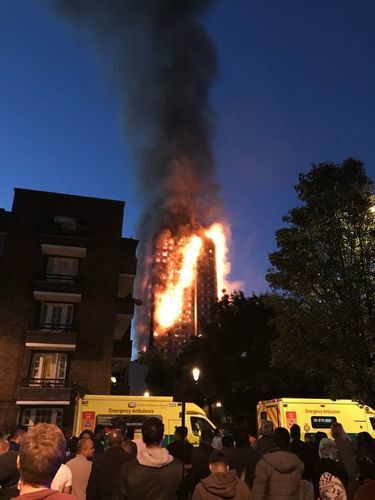 The London Fire Brigade confirms a number of people have died in the massive blaze that has engulfed a large tower block in the Western part of the city. Dozens are injured. The cause is unknown. Britain's ambulance service now says it has taken more than 50 patients to five hospitals following an overnight fire that engulfed a tower block. Here's what the fire looked like overnight. London Fire Brigade said over 200 firefighters were on the scene to tackle the major blaze at a tower block in north Kensington. Despite the Brexit vote and impact of the Stamp Duty, London remains a top city in prime property rankings. Christie's International Realty says there's no shortage of cash, but buyers are "sitting on their hands" to get more clarity on political risk in the UK. Dan Conn, CEO at Christie's International Real Estate says transaction volumes and pricing in London fell through 2016. Conn says it has been around 10 years since volumes for prime central London were at this level. 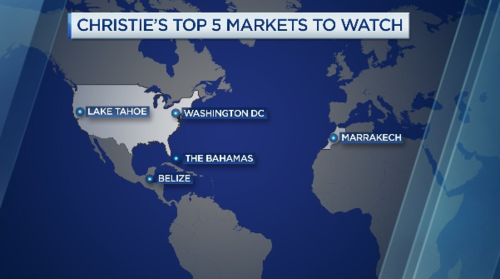 The Christie's mans says unwinding populist measures is tough for governments and therefore the transaction taxes that have helped to slow property movement are not necessarily around the corner. Conn says the U.K. market will always be strong and it is hard to go wrong for investors who want to preserve capital. He points to Hong Kong's recent rebound and identifies it as a safe have investment for those in China with capital. A magnitude 7 earthquake has hit off the coast of Mexico near Chiapas, according to Reuters citing the Pacific Tsunami Warning Center. The earthquake hit 3km south of San Pablo in Guatemala. The Conservatives and Democratic Unionists are reportedly on the cusp of announcing a deal that would see the DUP support the minority Conservative government on key votes. The leaders of both parties met yesterday to thrash out an agreement, with DUP chief commenting that the discussions had progressed well. However, there's significant domestic opposition to the deal amid fears that it could jeopardise the Good Friday Agreement. Securing a tie-up with the DUP would solve one headache for Theresa May, but on the international front her problems only appear to be multiplying. The fall in sterling following the U.K. general election means the French economy is now bigger than U.K.'s on the basis of current exchange rates. The Commissioner of the London Brigade, Dany Cotton, gave this statement within the last hour. The Mayor of London, Sadiq Khan, has said questions will need to be answered following a deadly fire at a London tower block. We can't have a situation where people's safety is put at risk by bad advice or poor maintenance. Economists' forecasts for a third rate hike this year have faded, amid worries of weakening inflation. But markets are most focused on what the Fed will say about reducing its balance sheet. Janet Yellen has signaled the central bank could begin unwinding the $4.5 trillion of bonds it holds this year, and investors are looking for more details as to when and how that process will begin. On set Jeffrey Cleveland, Chief Economist at Payden & Rygel says the 5 major central banks have $20 trillion plus of assets on their balance sheet. He says the Fed will simply give the assets back to the U.S. Treasury as it looks to wind down its bulging balance sheet. On the U.S. economy, Cleveland says wage increases are coming and the labor market is in a very healthy place with very low levels of layoffs. Recent weakness in oil demand growth is likely to prove transitory, according to the IEA's June market report. 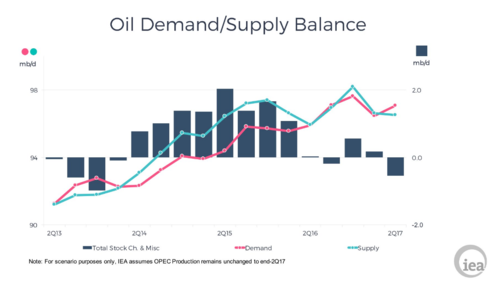 The agency saw global stocks remaining "stubbornly high," while forecasting a modest demand acceleration in 2018 to 99.3 million barrels per day. That release prompting a sell-off in oil which has pared to an extent by 09:20 a.m. London time. OPEC crude output rose by 290 thousand barrels per day in May to 32.08 million barrels a day, the highest level seen so far this year. This is due to comebacks in Libya and Nigeria, which are exempt from supply cuts, IEA noted. “Output from members bound by the production deal edged lower, which kept year-to-date compliance strong at 96 percent,” the report said. Global oil supply also increased by 585 thousand barrels per day in May to 96.69 million barrels a day, the IEA report also showed. As a result, output grew from a year ago by 1.25 million barrels a day, the highest annual increase since February 2016. Shares in Swedish measurement technology firm, Hexagon, have a hit a record high on the back of reports the company is considering putting itself up for sale. The Wall Street Journal is reporting that the potential acquisition would value Hexagon at around $20 billion. The company issued a statement saying it's evaluating the options available to it to determine if they offer shareholder value. Why is it up for sale? Because the man who runs this owns more than half of the voting shares. And he's done well and is stepping down. Steve adds that the company is in a sweet spot as the world turns to "industrial digitization". He says if you go to Davos, it is all you hear about. The IEA has released this diagram to illustrate supply and demand pressures. The IEA says "recent weaknesses in demand growth are likely to prove transitory". The U.K. weekly total earnings for has come in +2.1 percent year on year in the 3 months to April. That's the weakest since February 2016. 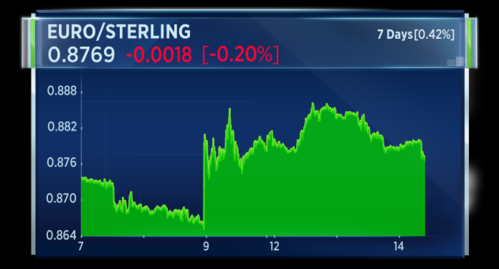 Combined with a higher rate of inflation that we saw printed yesterday and the U.K. consumer is set for a squeeze. 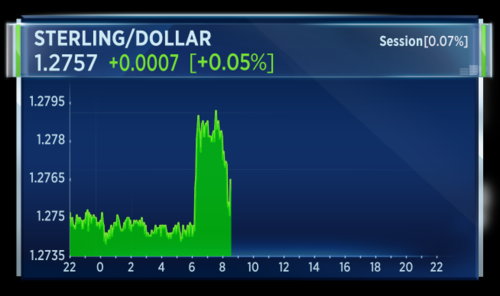 There has been a bit of volatility in sterling this morning but on session terms, we are pretty much where we started the day.